Since it can be made from many different fruits, eau-de-vie offers endless possibilities. Here, six makers who turn out exceptional bottles. Steve McCarthy founded this Portland, Oregon–based distillery in 1986, when he decided to experiment with his family’s pear crop. He now produces seven kinds of eaux-de-vie from local fruit, including blue and Mirabelle plums. He also makes a peculiar (but delicious) brandy from the buds of Douglas fir trees. clearcreekdistillery.com. This new western-Colorado producer buys only organic fruit grown within 20 miles of the distillery, including pears, cherries and the Rosa and Cresthaven peaches it uses for its summery peach eau-de-vie. peakspirits.com. 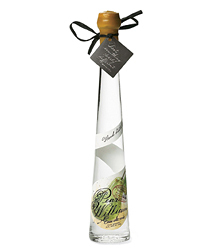 This Austrian distillery makes the deeply flavored Pear Williams eau-de-vie and the excellent Blume Marillen (“Blossom of the Apricot”), a floral, apricot-based brandy with fruit from the Danube Valley. alpenz.com. Many think fastidious Austrian distiller Hans Reisetbauer makes the world’s best eau-de-vie (at up to $170 a bottle, it’s priced accordingly). Reisetbauer’s enormous portfolio includes classic eaux-de-vie varieties and bottles featuring unlikely flavors like carrot, ginger and the piquant rowanberry. reisetbauer.at. Alsace native Jörg Rupf, who founded this Alameda, California, distillery in 1983, has helped spread the eau-de-vie gospel to many other microdistillers. In addition to crafting cherry, pear and raspberry eaux-de-vie, St. George offers experimental brandies, including one derived from Thai basil. stgeorgespirits.com. 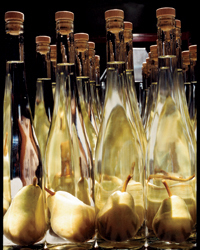 This 10-year-old Connecticut-based distillery bottles four kinds of premium eaux-de-vie, including the fragrant Pear Williams, made from ripe Bartlett pears. westfordhill.com.